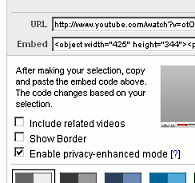 While looking into the possibility to play embedded YouTube clips with html5’s video-element on this blog, I noticed Google added an ‘Enable privacy-enhanced mode‘ flag to the embed-options. This small tweak ensures that visitors who arrive on a page that has YouTube embedded, don’t immediately get tracking cookies stuffed down their throat. Unless they play the video or click through to youtube.com, that is. The change has no impact whatsoever on the user experience, so I immediately tweaked the code of the Smart YouTube WordPress plugin on my server and I asked the developer to add the option to his plugin as well. Yet another small step in the fight against Google’s omniscience! This entry was posted in blog, Internet, lang:en, wordpress and tagged google privacy, smart youtube, youtube on 25 January 2010 by frank.